Organic Black Pepper Essential Oil (Piper Nigrum) - Sweetgrass&Rain Inc. This climbing woody vine uses trees or other supports to grow to about twenty feet high but is normally kept to about 12 feet for commercial purposes and has a lifespan of about twenty years. The word 'pepper' is derived from the Latin word piper, which was taken from the Sanskrit word pippali. 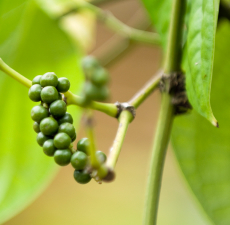 Pepper was historically used by Greeks and Romans and was at one time levied a tax by the Turks. During the Middle Ages the Dutch, the French and the Portuguese often went to war to fight over this lucrative trade with the Far East. Black Pepper Essential Oil has a sharp, spicy scent faintly reminiscent of Clove.